A crash-landing in the Amazon leaves four children stranded in the deep jungle. They are Fred, a tall, white English boy, biracial Brazilian siblings Lila and 5-year-old Max, and a pale, white English girl, Constantia. Together they search for shelter and forage for edible fruits and larva. When Fred stumbles upon an old map, they decide to follow it to the X. In their handmade raft the crew travels down the river, through murky and clear waters, until they rediscover a lost city. Among the ruins they meet a mysterious man. He refuses to give his name, but will he refuse to help them get home? Rundell breathes character into the Amazon rain forest. The sounds, smells, flora, and fauna are vivid and tangible in the mind. The children are not as colorful, unfortunately. Fred, Lila, and Con give voice to their fears at every step, from climbing trees to facing down wild animals. Max has brief moments of wisdom in between bouts of tears or unbridled joy. 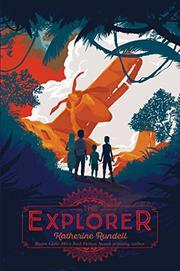 The unnamed explorer does add some vibrancy to the book and commands attention despite the lush backdrop. His commentary on the effects of European imperialism is commendable although brief.